thef1rmwareumbrella: Apple Lightning Connector Dynamically Assigns Pins for Reversible Use? Apple Lightning Connector Dynamically Assigns Pins for Reversible Use? Apple's new Lightning connector appears to dynamically assigns pins for reversible use, according to a AppleInsider report. Peter Bradstock from Double Helix Cables provided the site with some interesting information on the connector. He notes that some features of the connector such as USB power are symmetrical on each side of the plug with pin 1 and pin 8 being connected. Other features such as data connections appear to be asymmetrical. "Take top pin 2 for example," he wrote in an e-mail to AppleInsider. "It is contiguous, electrically, with bottom pin 2. So, as the plug is inserted into the iPhone, if you have the cable in one way, pin 2 would go into the left side of the jack, flip it the other way and the same pair of pins is going to match up with the other side of the jack (as the electrical contacts in the iPhone's jacks are along the bottom)." 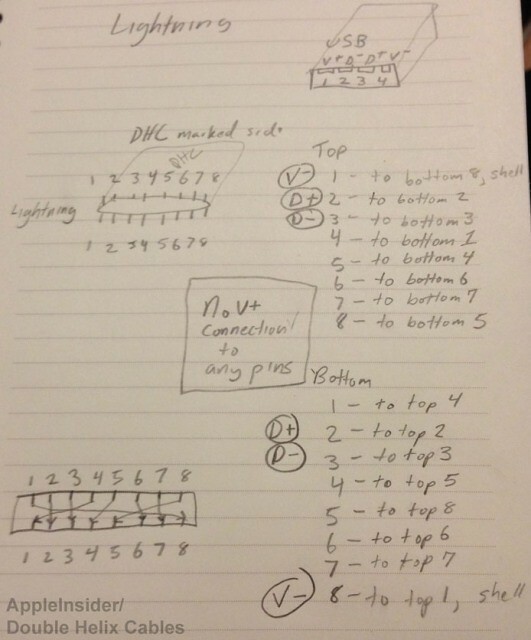 "Dynamic assignment of the pins is the only way for the USB data to be routed, since I've proven that top pin 2 and bottom pin 2 are the pins that go to the Data+ connection of the USB," he said. The complexity of the connector may be one of the reasons for the higher cost of the cable and adapters. Notably, the dynamic pin assignment could also explain the authentication chip included between the V+ contact of the USB and the power pin of the Lightning plug.